A very cheap alternative to buying a light shade. 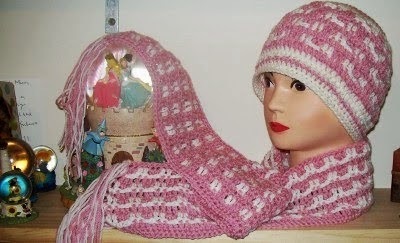 Make one yourself with a small amount of yarn, old beads and an existing light shade. I kept placing it around the light shade until if fit, then joined it into a circle. To get the round to stay in a circular shape I had to make sure the stitch count was dividable by the number 6. I did a couple of rounds of sc, then placed a shell st into 6 places. My stitch count for this was 54, 6 x 9 = 54, so every 9th stitch had a shell st placed into it. The next round consisted of a sc on each side of the shell st and chains replaced the remaining sc stitches. My pattern went like this. 1 sc, ch 6, skip 6 sc, 1 sc, make a shell in next st, repeat all the way around then join the round. 1 sc, ch 6, 1 sc, make a shell, repeat all the way around, then join. The very first thing I did was clean the light shade, then began making the new shade. I had to block it so it would sit nice, I just used the good old iron. Then I added some beads from an old necklace, they had their own rings which I hooked through a crochet stitch. My granddaughter loved it once the beads were added, she now has her own type of chandelier in her bedroom. Now I know I can do it, I can get more daring and make another even more spectacular! The Art Of Crochet, video tutorials great!